After eating a lot of soup and a very unhappy stomach for the last few weeks, I wanted to make something filling, tasty and comforting. 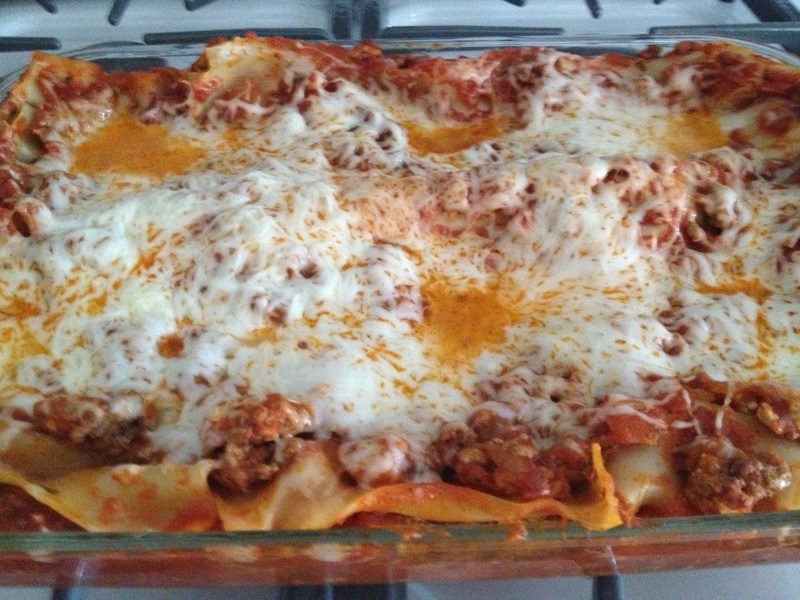 So what better dish than lasagna. For dessert (you have to have dessert) I did my very first attempt at panna cotta. Turns out, this is a stupidly simple dessert to make. I dissolved some gelatin in water, heated cream and sugar, added a little vanilla and combined the two. Chill and done. I got the basic recipe from David Lebovitz. I did cut it in half since there were only four of us, but this took about fifteen minutes to make. 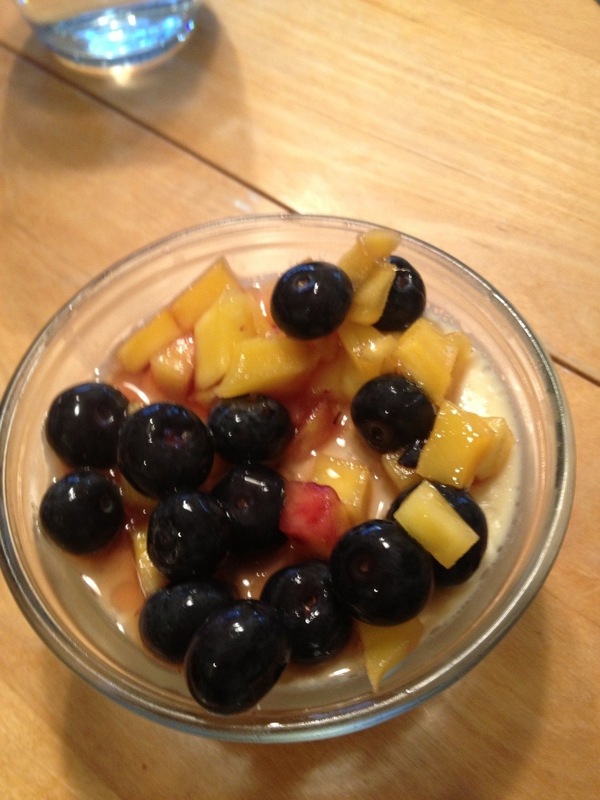 I topped it with macerated blueberries and mango from my veggie basket and came out with a panna cotta Dad said was better than a restaurant’s and Mom actually liked. 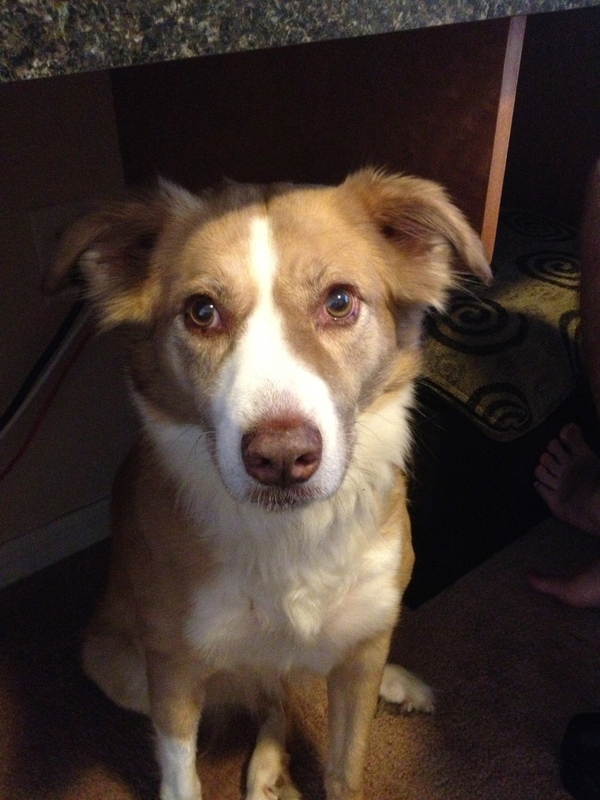 (Turns out she is not a panna cotta fan -who knew?) Bob said it was a definite do again. I’ll take all of those as high praise. Erin, I did find a vegan version that I am dying to try, so come visit so I have an excuse to make it! As someone who grew up in Jersey, January is cold, snow, ice and hot chocolate. It isn’t gardening and open the windows and air out the house. It just isn’t. And since my very green thumb of Jersey is a little pale yellow turning brown, I am sticking to things that are harder to kill. 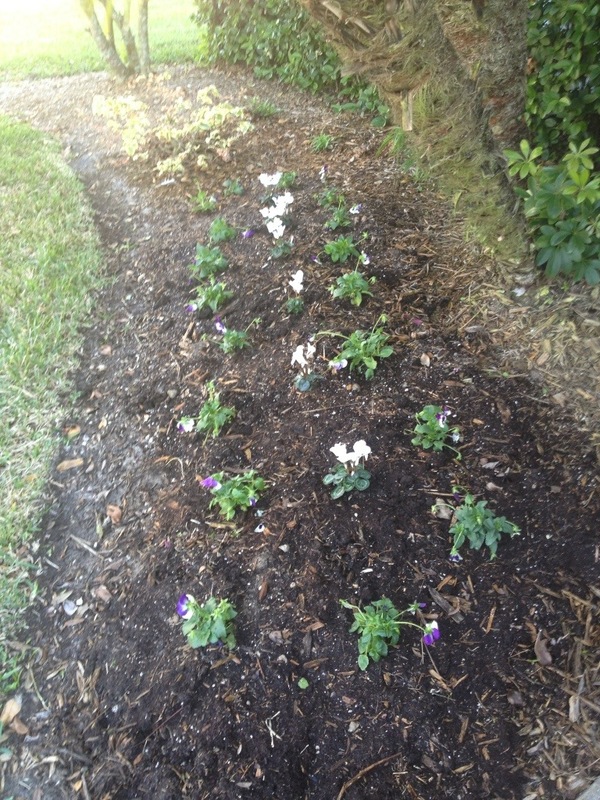 But today was beautiful out and I decided I wanted to plant some pretty flowers. 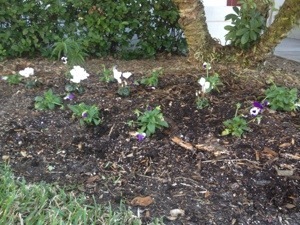 I picked up some pansy and another flower I forget the name of and redid the front garden. It isn’t the tulips I had u north, but I think they are pretty and cheery and a nice splash of color. 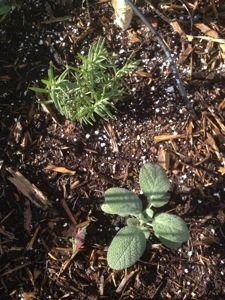 In addition, I added a few more herbs to the back garden. I decided to forgo the veggies and just get them from my veggie basket and the farmer’s market. But herbs go a long way when cooking so I picked up some purple basil (hoping to get some sweet basil from mom), rosemary, sage, and parsley (let’s hope Leia can’t get to it and eat it this time). 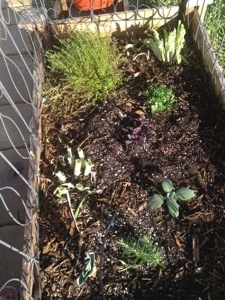 This means we have the every growing scallions and thyme with a few leeks and now some new fresh herbs. It’s a cute little garden and it makes me happy. On the food front … Food still does not like me. I’m eating a little more, but nothing is sitting well in my stomach these days. I think it’s stress, but who knows. Maybe the residuals of the cold/virus/whatever this is. 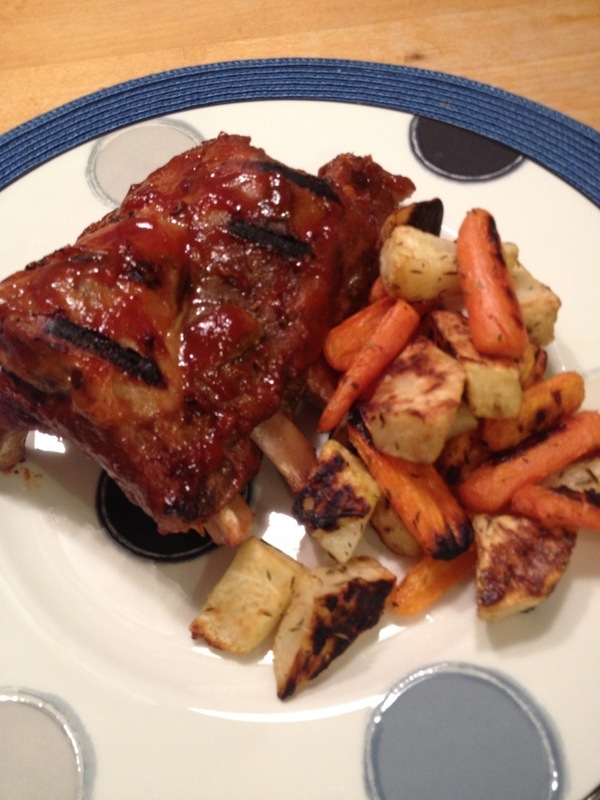 But … I did make some ribs this weekend that came out rather well. I slow cooked them in the crockpot with beer and apple juice. Oddly. It worked. I finished them on the grill with the BBQ sauce. And that is not potatoes on the plate! My veggie basket had celery root in it. I’ve never had or made celery root before. So … I roasted them kind of like potatoes with a little olive oil, salt, pepper and thyme (from the garden of course) and then added some carrots. Pretty darn good. Not something I would seek out and buy, but I did like it enough to make again the next time I have it in the basket. My intention today was to get over this cold, but it is just lingering. And since nothing sounds good, I decided to go with a flavorful dish for dinner in hopes of getting my appetite back. 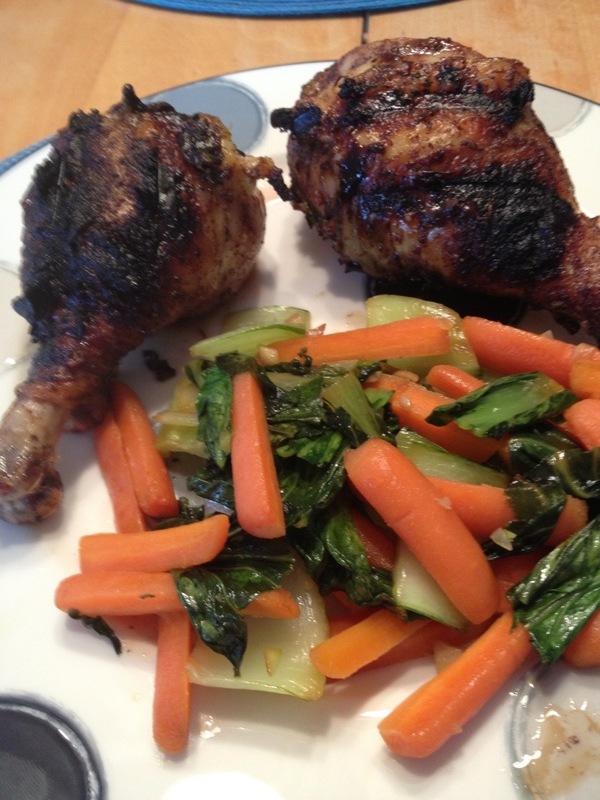 So … Jerk chicken it was. My recipe for this called for cider vinegar and nutmeg, neither of which I have. I should have both, but somehow when I go shopping, I always forget to put them on the list. So, I decided to improvise. The marinade – white balsamic vinegar, two scallions chopped, three cloves of chopped garlic, olive oil, thyme, allspice, cinnamon, cayenne pepper, chili pepper, salt and a little brown sugar. 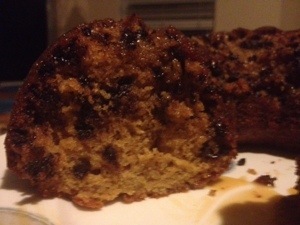 I debated using honey and molasses, but wasn’t quite up for that much of an experiment. Chicken marinated for a few hours then hit the grill. 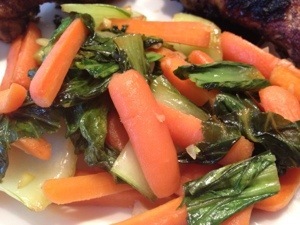 While the chicken was grilling, I took the bok choy from my veggie basket and braised it in veggie broth with some carrots and garlic (also from the veggie basket this week). The results were surprisingly good. And oddly, the Jamaican and slightly Asian flavors worked well together. I almost called is my “wanderlust dinner” post. I will say, a lot of times there is nothing prettier on the plate than a colorful pile of veggies. It is almost enough to get my appetite back. Almost. I haven’t done a ton of cooking this week as the nasty cold/virus thing just will not go away. But last night I was feeling a little better and decided, after dinner, to make a cake. And the one I wanted was the chocolate chip cake. Think big, moist, soft, chewy chocolate chip cookie in cake form. So the basics of this are a lot like chocolate chip cookies – brown sugar, white sugar, butter, eggs, vanilla, baking soda, baking powder, salt and flour. It is the adding of milk to make a cake batter instead of cookies that is the real difference. And the best part is that you put everything together and mix – no add this then that to this recipe. I made this as a bunt cake as, for some reason, I do not have any round cake pans. Weird. 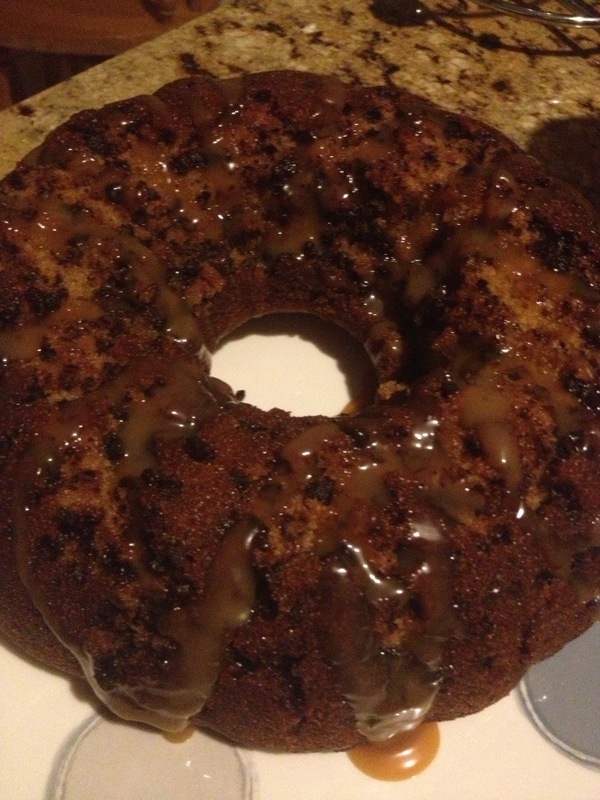 But, the bunt cake came out well and I drizzled some caramel over it when it was still warm. Bob really liked is one, and his description is the title of the post! 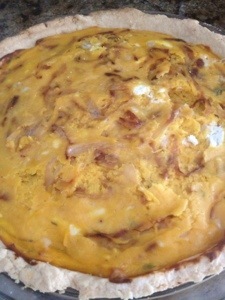 I also tried a butternut squash pie for lunch yesterday. I roasted the butternut squash and caramelized onions. Once the squash was nice a soft, I scooped out the flesh and blended it with an egg and some cream. I folded in goat cheese and sheep cheese and added a little Parmesan with thyme, salt and pepper. I did make a crust – I figured I was sick and so I get the crust this week – but this one would be really good with no crust. I am hoping that I can get a few more things made this week, but we will have to see if the virus will go away. 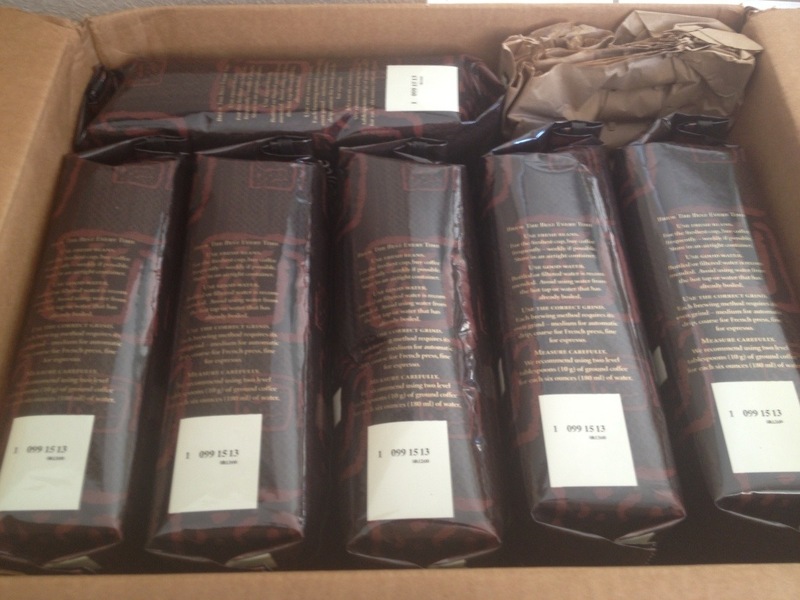 My coffee arrived this week. The coffee snob in me is super excited! And yes, that is a box with twelve pounds of coffee in it. I am super picky about coffee. 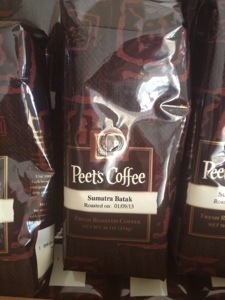 A number of years ago I found Peet’s on line. What I loved was the little bars that showed the body, light to full, and the brightness, smooth to bright. This makes picking out kinds of coffee so much easier. Initially I tried a lot of different kinds, from many, many regions. The scientist gene kicked in and I kept track of what each coffee tasted like to me, how bitter it was to my overly sensitive bitter receptors, how it impacted my stomach, etc. (Oh, I should say I put the coffees in unlabeled airtight bags, numbered the coffees and wrote my notes by number, not name, to prevent undo influence of the subconscious. Each coffee was in two to three different bags so I would use each at different times and not know which I was having. Yes, I am that much of a nerd.) After about a year, I took all my data and did some analysis. I found I did not like South American coffee’s for the most part. They were generally harder on my stomach and had more bitter in them. Arabian coffees faired well, but my favorites were Indonesian. Sumatra in particular with Java a close second, but Sumatran coffee had my most favorable notes consistently. One coffee in particular, found after the original experiment, became my absolute favorite. Sumatra Batak or Sumatra Blue Batak. This coffee can only be found once per year and it has a full body and very smooth acidity. Even my ‘broccoli is bitter’ taste buds find no bitter notes in this coffee. It has, to me, the best flavor, and a creamy, velvety texture that just makes coffee enjoyable. It is the one coffee I love as much today as I did when I first started drinking it. So much so that, yes, I ordered twelve pounds of it. This won’t last the entire year, but interspersed with some others – Aged Sumatra and Sulawesi-Kalosi for the most part – I can make it through the year until the next offering. Couldn’t help it. Had to post it. 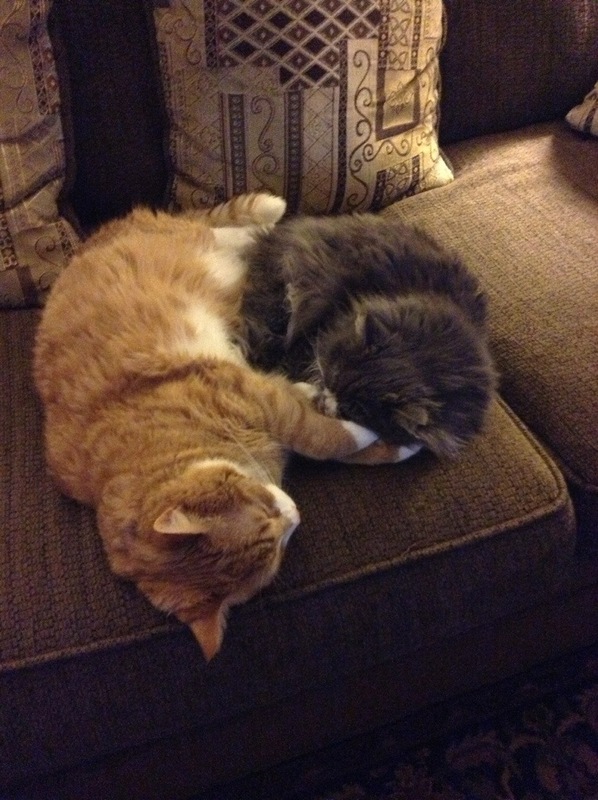 They are just so darn cute. This weekend I wanted something on the lighter side. 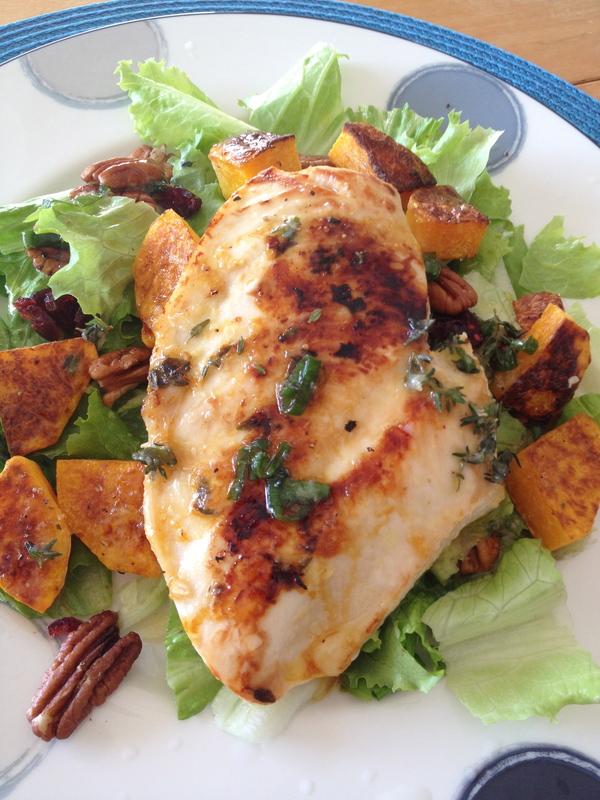 The weather was perfect – low 80s – so salads and summer-y dishes were an option. But the evenings were cool and it is January with football on, so soup sounded really good. So … I went with both. The soup was all home-made. I started with the ham bone from the ham we had at Thanksgiving (yes, I kept it) and used that with some carrots, onion and celery for a nice broth. I let that simmer for a few hours, strained it, added new chopped carrots, celery, a can of diced tomatoes, some ham and barley. Let it simmer for a little while longer and you have soup. Really, really good soup. Light, a little smokey, and lots of flavor. I know what I am having for lunch this week. Lunch was a little more summer-y. I had made a similar salad a few months ago with all the fall flavors. This time I didn’t have sage or apple juice (and I know now not to attempt juicing my own apples) so I went with a citrus/thyme marinade. So … juice of one lemon, juice of one orange, thyme, chopped scallions and some crushed garlic with a little bit of olive oil. Marinade overnight (because we decided to have it today instead of yesterday). Pan fried with no oil – just drain the marinade and whatever was left was enough. The salad was just lettuce, craisons, pecans, roasted butternut squash and a dressing of juice of one orange, olive oil, thyme, scallions and garlic. That was it. Nice, light and probably pretty good for you. Happy eating – I have a few things on the menu this week. Hopefully work will cooperate and I will get home in time to actually cook them this week.